2018 is the 150th anniversary of the birth of one of the world's most remarkable and influential architects, Glasgow-born Charles Rennie Mackintosh. 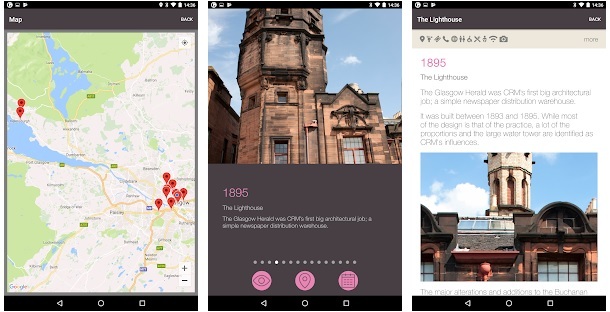 To honour and celebrate the man and his work, the City of Glasgow has installed an innovative network of Bluetooth beacons at all Mackintosh venues, such as the Glasgow School of Art, Scotland Street School Museum, Mackintosh at The Willow and many more. Walking around the city, each beacon communicates with the Go Glasgow app to reveal the story of each building as you arrive or pass by. The app also provides practical information for each venue, Mackintosh news & events and a map of all the venues. Go Glasgow is an innovative mobile app. It uses software on your mobile device to connect with real world hardware installed in public locations; each interaction depends on where and how a beacon is fitted. This means you may not experience exactly the same behaviour at every location. Note: Go Glasgow uses a special class of low energy Bluetooth services. This means it uses little power and can run continuously in background without draining your device battery.All beacons are fitted in the street except at the Glasgow School of Art where the beacon is indoors, inside the visitor centre. There is no beacon fitted at the Mackintosh Club, Helensburgh. Go Glasgow is a CGI solution for Glasgow City Council in partnership with Glasgow Life and the Charles Rennie Mackintosh Society.